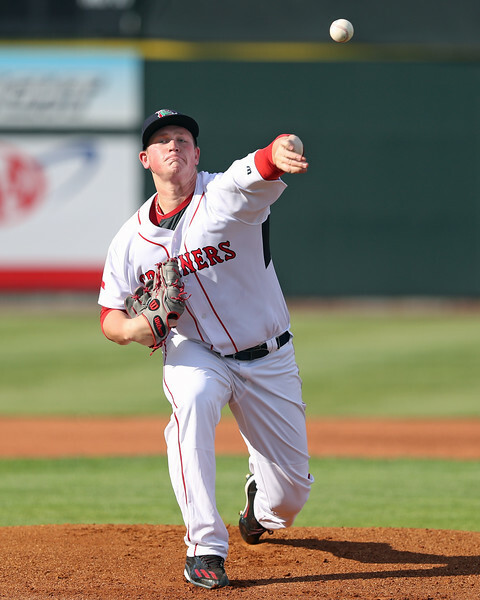 In his first start of the 2017 season, left-hander Jay Groome allowed nine earned runs in an inning and a third before leaving with a lat injury that would keep him sidelined for two months. The start of the Lowell Spinners’ season coincided with the start of a rehab assignment for Groome, and I was able to attend Groome’s first two starts there. Groome’s first start lasted just 2 1/3 innings before being interrupted mid-at-bat by rain. In that outing, he struck out three and walked one while allowing one hit. Five days later, Groome lasted 3 2/3 innings, allowing four hits and walking two with five strikeouts before leaving after 73 pitches. It was clear Groome was working out the kinks during these outings. He still showed flashes of why he is so highly regarded, while at the same time showing that he still has a long way to go developmentally. Groome is still only 18 years old, but has the build of someone much older than that. He has a wide frame already, with a well-developed lower half. Groome is listed at 6-foot-6, 220 pounds, but looks heavier than that and will have to watch his body as he matures. For someone his size, Groome has remarkably smooth mechanics. He throws from a three-quarters arm slot with a high leg kick and clean arm action. His delivery is free and easy, and it is repeatable over long outings. Though some pre-draft reports had Groome sitting in the mid-90s and touching 97 mph, I’ve now seen Groome in game action five times and have yet to see him reach higher than 94 mph or sit higher than the low-90s. He only touched 94 mph in both outings to start his rehab stint and mostly sat 89-92 mph. In the first outing, Groome came out with slightly more velocity and sat 91-93 mph in the first inning, but by the second he was down mostly to 90-92 mph, with a few 88-89 and 93 mph pitches sprinkled in. In his second outing, he didn’t even approach that level early, sitting 91-92 mph in the first before settling in at 88-91 mph. He did run into some trouble in the fourth inning of the second outing and was able to dial it up, hitting 92 and 94 mph once each. With the ease of Groome’s delivery, I think he has slightly more velocity in there for when he needs it, but he may feel he can command his fastball better at 90-92 mph. In both games he had some trouble with his command, but that is something you’d expect after two months away from game action. When he kept the ball down, the fastball showed life, and he was still around the zone for the most part. Given Groome’s future command profile, youth, and projection with the pitch, his fastball still grades as a potential plus offering. Groome’s best pitch both right now and going forward is his curveball, which even in these short stints he really was able to show off. At its best, it shows above-average potential and will flash even higher. He threw the pitch 75-78 mph in the first outing and 75-80 mph in the second. He has supreme confidence in the curve and advanced feel, willing to throw it in any count to both right-handed and left-handed hitters. When he gets over the pitch it shows tight rotation and depth, and he can locate it both in the zone for a strike and outside when looking to get hitters to chase. At times in the second outing he didn’t snap it off consistently, and as a result was struggling to keep it in the zone. Regardless, the pitch is a potential big league-quality out pitch, capable of missing bats at the highest level. One area that will be key for Groome to reach his potential is the development of his changeup, which he throws at 80-83 mph. Even in two short outings, he incorporated the pitch a lot more than he had when I’d seen him before. It still clearly lags behind his other pitches, and he is still developing feel for it. At times, it would show average potential with late fade. At other times, it was a well-below-average pitch, coming in straight and firm, looking like a fastball he took something off of. Long term, the pitch has average potential, but right now it isn’t a reliable third pitch and is something that he is going to have to force himself to use in games, even if it might cost him results-wise for now. After a strong third start with Lowell, Groome was activated from the Greenville disabled list and made a much better impression in his second Drive start, allowing just one hit and one walk while striking out seven over five scoreless innings. South Atlantic League hitters should prove to be a good test for him, and given the time he’s missed this year, it wouldn’t be unexpected for him to return to Greenville to start the 2018 season as well, with an eye towards a midseason promotion to Salem, unless he mows through hitters the way he did on Tuesday for the rest of the season. Groome’s ceiling is high, and he is still the highest profile arm in the Red Sox system even after the selection of Missouri right-hander Tanner Houck in the first round of this year’s draft and breakthrough performance of 18-year-old Bryan Mata in Greenville. If Groome can put everything together, he could develop into a true workhorse starter capable of throwing 200-plus innings a year with three pitches capable of missing bats. The gap between what he is now and that upside is wide, however, and Groome has a lot of work to do. He is high-risk prospect and his development will take some time and could be a slow, gradual process.